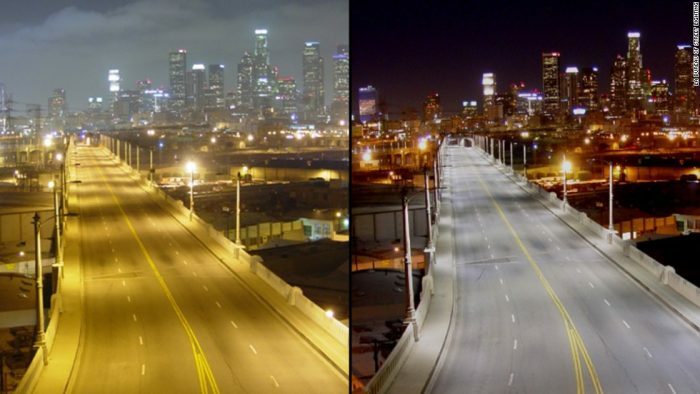 LED street lights are so hazardous to people’s health that the American Medical Association (AMA) has adopted an official policy about them. Long-lasting LED lights are quickly replacing existing streetlights because they save municipalities money on energy and maintenance. But the AMA’s stance reflects the importance of properly designing new technologies and the tight link between light and human health. But blue light has a dark side. Research suggests that blue light can prevent people from sleeping, or make them sleep poorly, because it throws off the body’s circadian rhythm. This is one of the problems the AMA sites in its statement. In addition to street lights, blue light also emanates from cell phones, computers, tablets, and other electronic devices. This is why so many doctors and health experts recommend never using these gadgets at bedtime. According to researchers at Harvard, blue light is useful during the day because it boosts attention, reaction times, and mood. But blue light also suppresses the secretion of melatonin, a hormone secreted by the brain that makes people feel sleepy at night. Melatonin boosts the immune system, and is known to have anti-aging properties, as well. Green light also suppresses the secretion of melatonin, but blue light suppresses it for about twice as long and was shown in studies to shift circadian rhythms by twice as much (3 hours versus 1.5 hours). A white LED light at CT 4,000 K or 5,000 K contains a high level of short-wavelength light blue. Many cities, including Seattle and New York City, have chosen these CT-count lights to retrofit their street lighting. The CT count of 4,000K or 5,000K in LED lights is significantly higher than the CT count of incandescent bulbs, which may have a CT of 2,400K. But many people have started complaining about the harshness of these lights, and this is the other problem the AMA refers to in the statement. In Davis, California, for example, residents have demanded a complete replacement of the high color temperature LED street lights. The new “white” LED lights come with bothersome glare that can cause discomfort in the eyes. The light concentration and blue light in white LED’s cause pupillary constriction in the eyes. Blue light scatters more in the eye than the longer wavelengths of yellow and red, and sufficient levels can damage the retina. “The detrimental effects of high-intensity LED lighting are not limited to humans. Excessive outdoor lighting disrupts many species that need a dark environment. For instance, poorly designed LED lighting disorients some bird, insect, turtle and fish species, and U.S. national parks have adopted optimal lighting designs and practices that minimize the effects of light pollution on the environment….